I wish the song from Julie Andrews in ‘The Sound Of Music’ was right but it doesn’t ring true. Since the time when I was a young child, doctors used to give my mother pills known as ‘Speed’ to take off weight. The problems that came along with them were that the pills would make you feel like you just drank eighty cans of pure caffeine and were dangerous to you health in general. Then over the years, we have seen many other prescription and over the counter attempts. 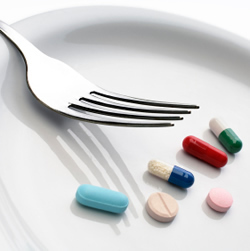 Each with different side effects that would signal short term weight loss due to the many different side effects. While I admire any attempt to help people overcome this dreaded battle and disease, they all fail in one major thing. None of the diet pill companies will teach you how to accompany it by “ A healthy choice of a food diet to go with it”. Then of course we all regain the weight with another ten percent or so. There is even a pill out there that traps you in the washroom with very unpleasant stomach problems if you eat too much fat in your diet. How far will one person go without having to do the real work of learning how to eat again. I know the battle myself all to well and it can be very exhausting and much easier to say then to do. Luckily, there are very good groups out there that have seen good success. Everyone from Weight Watchers to Over-eaters Anonymous have been a great help to many of my friends and colleagues. The point is that there is no quick fix or magic bullet. Only damage that we can repeatedly do to each other. I hope to hear your thoughts on this matter as more drugs are pushed to the market to try and accomplish what no one has in the last hundred years. This entry was posted in Director Notes, Film, Food, Hot Topic, Serious Issues and tagged Barry Blake, Barry Roskin, Barry Roskin Blake, childhood obesity, Diet, Diet Pills, documentary, exercise, fat acceptance, fat americans, fat to thin, Film, finding thin, finding thin documentary, finding thin film, findingthin, health, healthy, Julie Andrews, magic bullet, O.A., obesity, obesity epidemic, overeaters, overweight, P90x, The Sound of Music, weight, weight watchers, weightloss, why are we so fat, workouts. Bookmark the permalink. Love your site. Want to see the movie. Where do I find it? I will be sharing your link. Thanks for helping get the information out.